Some Volkswagen customers are indeed more equal than others. American drivers of dirty diesels are in line for a goodwill package worth $1,000 each, and the German carmaker may buy back some of the vehicles it manipulated to pass emissions tests. European drivers can expect no such goodies, and regulators already have rubber-stamped a cheap and cheerful recall. The European Commission is not amused by the disparity. In a tersely worded letter seen by Reuters, Industry Commissioner Elzbieta Bienkowska is urging VW boss Matthias Mueller to compensate European customers similarly to their U.S. counterparts. Reading between the lines, she is also questioning the European recall, asking VW to outline in depth the probable effect on toxic diesel emissions. The plea from Brussels is both well-intentioned and misguided at the same time. Mostly, it confuses cause and effect. VW’s two-tier response to the scandal simply reflects the weaker emissions regime put in place by Europe’s diesel-loving policymakers. U.S. regulators can in theory mete out fines of more than $45 billion for VW’s violations of the Clean Air Act. Moreover, an avalanche of class-action lawsuits by U.S. customers is advancing. Pre-emptively volunteering some compensation may help smooth the path with regulators and courts. In Europe, legal risks and potential penalties are far lower. At the same time, a U.S.-style refund would be significantly more expensive. Some 8.5 million customers are affected across the continent compared with 580,000 in the United States. Such a costly programme may be harder to reconcile with management’s fiduciary duties to shareholders. Bringing VW’s dirty diesels in line with European law is also much easier and cheaper. The rules only focus on laboratory results and ignore performance on the road. Moreover, Europe’s test procedures are less robust and the allowed level of toxic pollution is much higher. The transatlantic discrepancy is worth noting but merits a different response. Chasing an unwarranted, egalitarian penalty is naive at this point. Pursuing stricter standards and tougher enforcement is what would make a difference to Volkswagen and other automakers – even if not until next time. Volkswagen CEO Matthias Mueller speaks at their media reception during the North American International Auto Show in Detroit, Michigan, January 10, 2016. 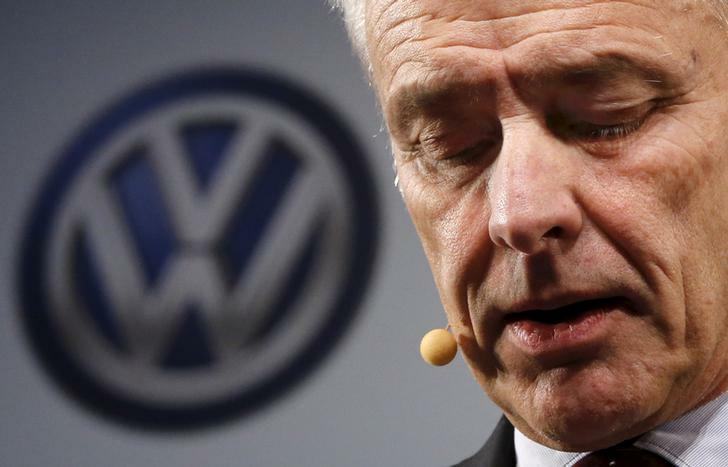 Europe’s industry commissioner has written to the chief executive of Volkswagen asking for detailed information on cars affected by the emissions scandal and calling for Europeans to be compensated in the same way as U.S. customers. The letter to Matthias Mueller, dated Jan. 15 and seen by Reuters, asks for the precise number of affected vehicles per member state and technical details on “corrective measures”. Industry Commissioner Elzbieta Bienkowska wants information on recall action in each EU country and an explanation of the probable impact on nitrogen oxide emissions per kilometre.